Loom Bands are this year’s biggest craze! Fun, creative and colourful, these little rubber bands can be shaped in to all sorts of things. 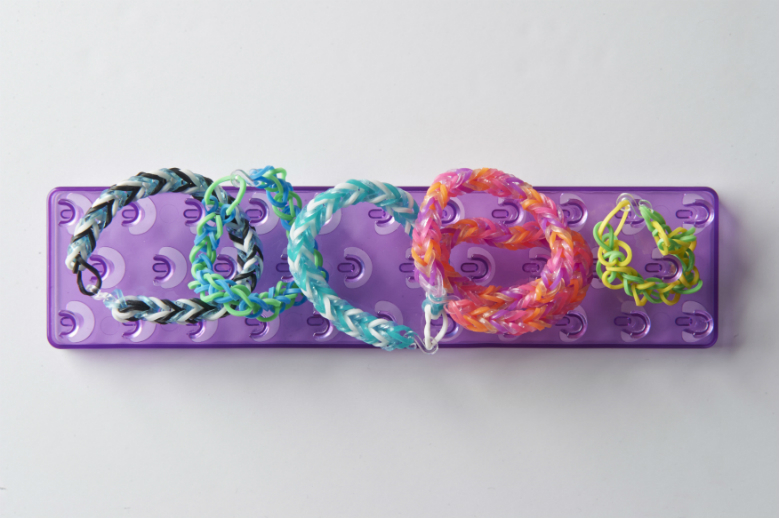 Today, we’ve put together a step-by-step tutorial to show you how to make your very own loom band bracelet. Just follow our simple instructions below to make two super easy loom band bracelet designs! It’s a great way to keep the kids entertained over the summer holidays and will definitely earn you some cool points… You never know – you might even find yourself hooked (pardon the pun)! 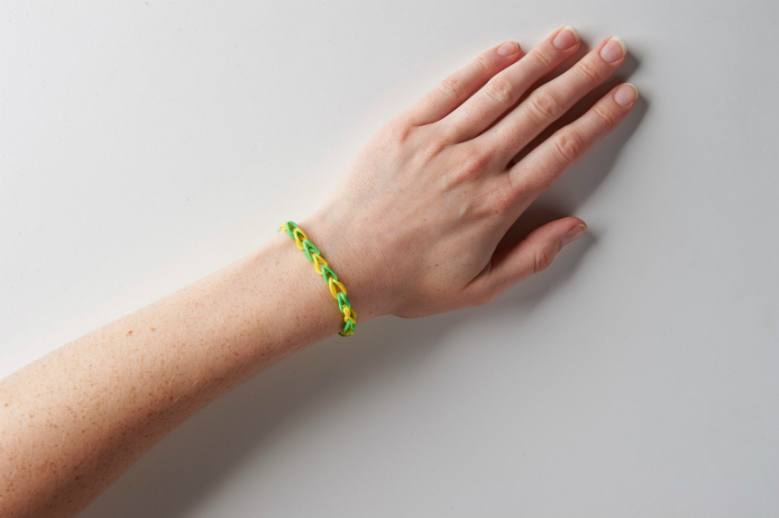 This one’s the easiest and most simple loom band design. For this, you’ll need a loom and around 20 loom bands in two of your favourite colours (though you can use more or less depending how big or small you need your band to be). We chose yellow and green. Easy right? Now we’re going to start looming. 2. Turn your loom around so the pegs are now facing towards you – this will help you to hook on to the bands. 4. Now we’re going to repeat the process again. Take your hook down into the middle of this peg and hook the bottom band (this time ours is yellow). Pull it up and off, this time taking it over to the left. Again, it should double-back on itself.Keep doing this all the way along your loom. When you’ve done it, it should look like the picture on the right, below. 5. Ta-da! Impressed with yourself? Now take your hook and hook it through the last link you made, pulling it carefully upwards to remove the bands from the peg. 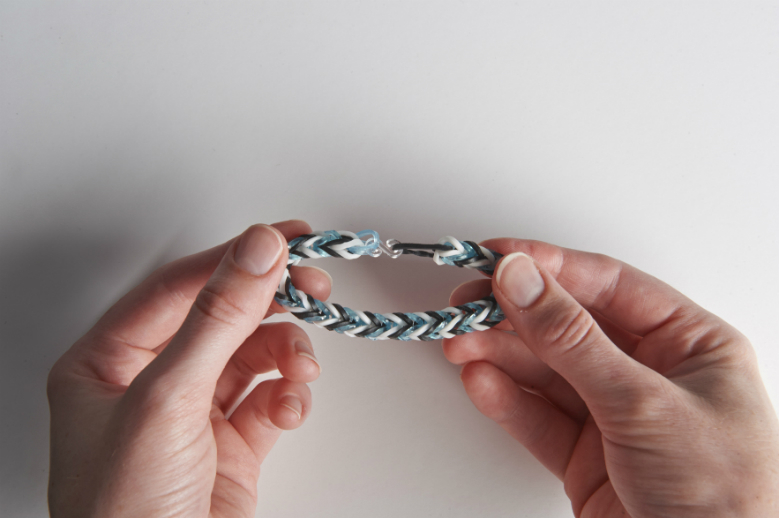 Use this link to pull the rest of the bands off gently, following the zig-zag pattern all the way along until you’ve got the whole bracelet on your hook. 6. Almost done! Transfer the link from the hook to your finger (don’t let go yet or it’ll come unravelled) and fasten it with an ‘S’ clip, as above. Once it’s attached, you can let go. Finally, take the big loop from the other end of your band and attach it to the other side of the ‘S’ clip. And that’s your bracelet! 1. For this design we’re only going to use the bottom two pegs! Make sure the loom is facing towards you so they resemble the letter ‘n’. 4. Take your next colour (ours is white) and stretch it over the two pegs. Do this again with your third colour (glittery blue). You should now have three bands on your pegs.After each stage, your loom should look like the pictures above. 5. Then we start looming. This time, we’re going to take the bottom band (black) from the outside, instead of through the middle as we did in the basic tutorial. Pull your bottom band up and over the other two bands, first on the right, then on the left. It should now be wrapped around the two, resting in the middle. 6. Now we’re going to do that again. Remember the order we did them in the first time? Black, white, glittery (or whichever colours you chose). We now need to add another of our first colour to our loom. Stretch this over your pegs and then repeat step five, taking the bottom (white) band from the outside and pulling it over the other two. Right side, then left side – as in the pictures below. 7. Now we’re going to add a band in our second colour (white) and repeat step six again, taking your bottom band (ours is glittery blue) up and over. You should now have made a link in each colour! It’s as easy as that! 8. Add a band of your third colour (glittery blue) and start the process again. Remember to keep adding another band after each link, following the same order: black, white, glittery blue, black, white, glittery blue. As you repeat the process, your band will grow off the end of your loom and you’ll really start to see the effect! 9. Once your bracelet is looking long enough, stop adding bands and take your bottom band over the top so you are left with only one band on the pegs (see the picture below). Remove this with your hook and fasten your brand new bracelet with an ‘S’ clip (as before). And you’re done! How easy was that? Now you’ve seen how easy it is, you can start creating all sorts of colour combinations and bracelet styles! 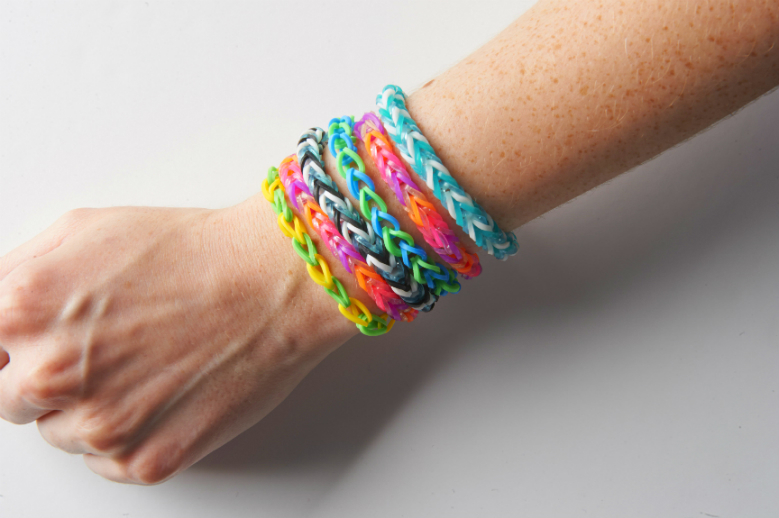 Take a look at our Loom Bands Set to get yourself started!